You will use the AWS OpsWorks Stacks console to create a stack. A stack is a collection of instances and related AWS resources that have a common purpose and that you want to manage together. (For more information, see Stacks.) For this walkthrough, there is only one instance. Before you begin, complete the prerequisites if you haven't already. Using your IAM user, sign in to the AWS OpsWorks Stacks console at https://console.aws.amazon.com/opsworks. If the Welcome to AWS OpsWorks Stacks page is displayed, choose Add your first stack or Add your first AWS OpsWorks Stacks stack (both choices do the same thing). The Add stack page is displayed. If the OpsWorks Dashboard page is displayed, choose Add stack. The Add stack page is displayed. 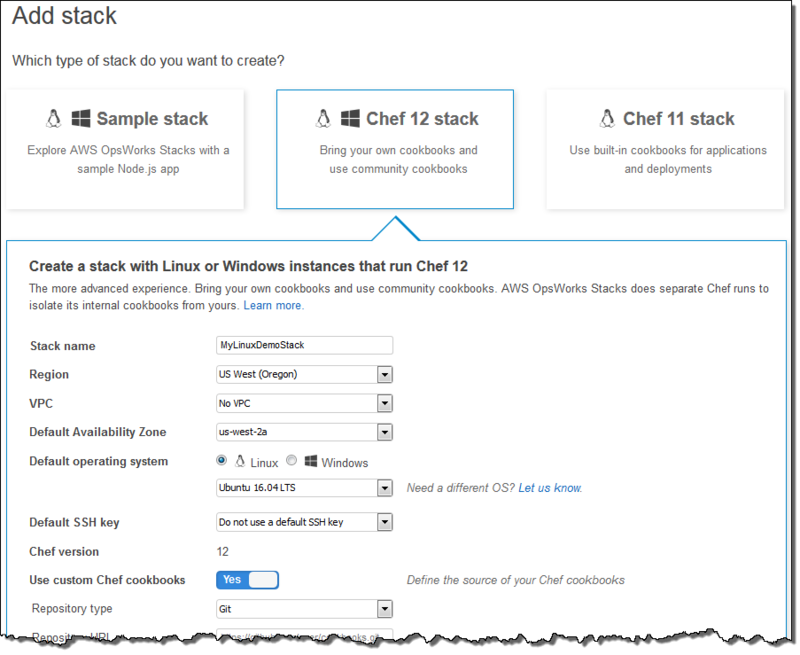 With the Add stack page displayed, choose Chef 12 stack if it is not already chosen for you. For Region, choose US West (Oregon). For Default operating system, choose Linux and Ubuntu 18.04 LTS. For Use custom Chef cookbooks, choose Yes. For Repository type, choose Http Archive. If aws-opsworks-service-role is available, choose it. If aws-opsworks-service-role is not available, choose New IAM role. If aws-opsworks-ec2-role is available, choose it. 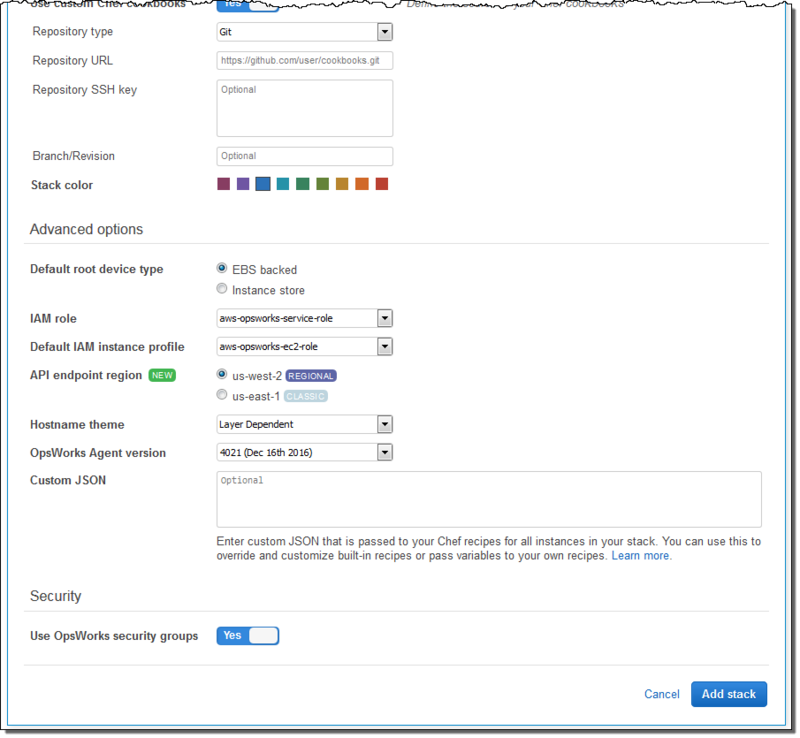 If aws-opsworks-ec2-role is not available, choose New IAM instance profile. For API endpoint region, choose the regional API endpoint with which you want the stack to be associated. If you want the stack to be in the US West (Oregon) region within the US East (N. Virginia) regional endpoint, choose us-east-1. If you want the stack to be both in the US West (Oregon) region and associated with the US West (Oregon) regional endpoint, choose us-west-2. The US East (N. Virginia) regional endpoint includes older AWS regions for backward compatibility, but it is a best practice to choose the regional endpoint that is closest to where you manage AWS. For more information, see Region Support. Choose Add Stack. AWS OpsWorks Stacks creates the stack and displays the MyLinuxDemoStack page. You now have a stack with the correct settings for this walkthrough. In the next step, you will add a layer to the stack.